That recipe title needed an exclamation mark. 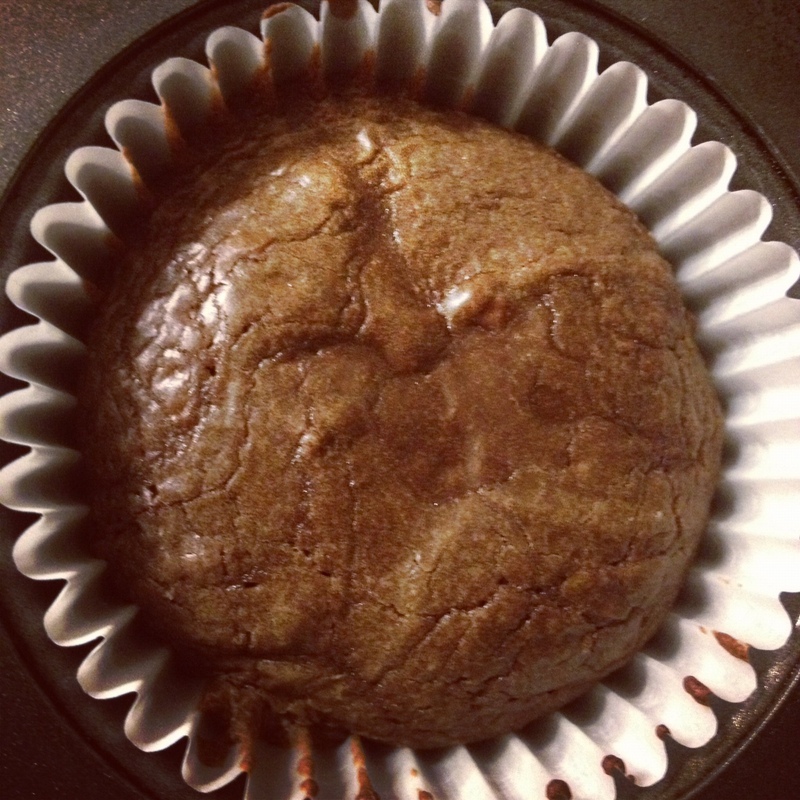 Two kinds of chocolate in one muffin? Get excited! 1. Line or grease a muffin tin and preheat your oven to 400F. 2. In a large bowl, mix together all the dry ingredients, including 1c of the chocolate chips. 3. In a smaller bowl, mix together the eggs, milk, oil and vanilla. 4. Combine the wet into the dry, bearing in mind that you want the batter to be a bit lumpy. 5. Evenly distribute the batter into the muffin cups and then top with the remaining chips. Bake for 20 minutes until the muffins have risen and darkened. 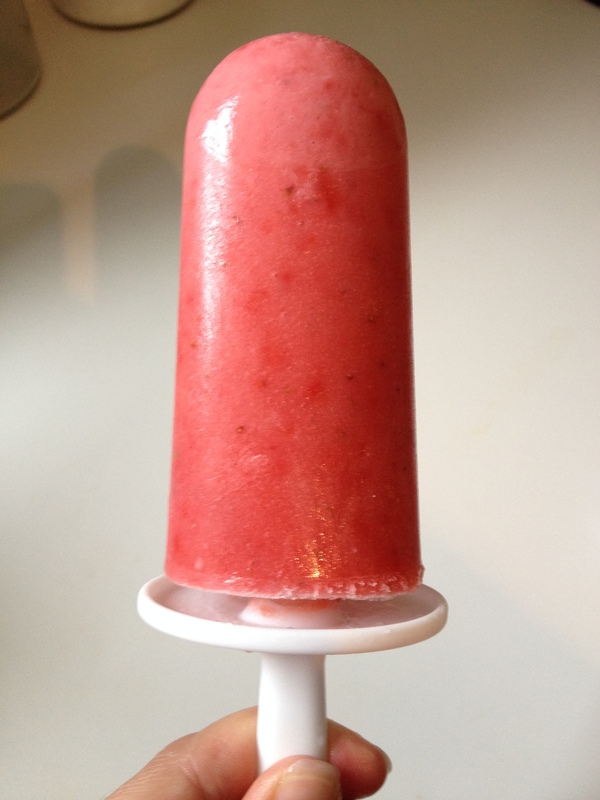 This week in Popsicle Mania: strawberry yogurt! These rank a little higher than the mango-lime treats I made last time, but that’s based purely on personal preference. These are creamy and smooth due to the inclusion of vanilla yogurt (for an extra strawberry flavour boost, you could certainly used flavoured yogurt instead, but make sure it’s the pre-mixed kind, like Iögo) and were met with many declarations of, “Yummy! !” from the foodNURDling. Can’t say he’s wrong. 1. Toss the strawberries in a bowl with the vanilla and sugar. Stir and let sit for 15 minutes. 2. Pour the yogurt and strawberries (juice included) into a blender. Pulse until smooth. 3. Split evenly among popsicle molds and freeze at least four hours. I love cookies. I love chewy cookies, I love crunchy cookies. I love cookies with stuff in the middle. I love cookies in/on top of of other things. You get the drift. 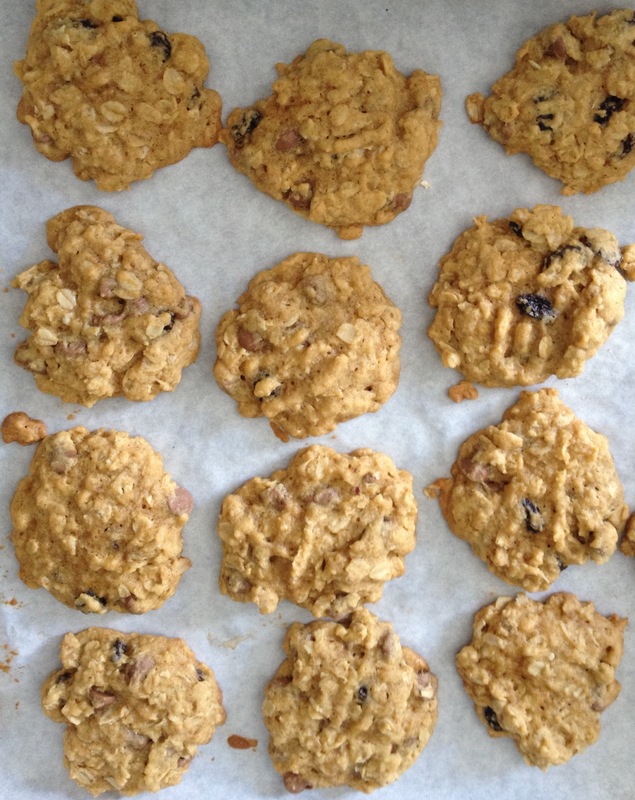 Oatmeal cookies are a particular favourite, but if they have raisins in them they must also have chocolate chips. No going for the fake out here: I firmly believe you can’t JUST do raisins but that’s me. It’s your prerogative to do only raisins, but know that I think you’re crazy. At the very least, toss in a couple of chips, for goodness sake. This recipe makes a pretty big batch, roughly two dozen. Make sure you don’t skip the flatten step, otherwise the cookies spend too long in the oven and can dry out. You’ll want to cook them in two batches, but they only take about 10 minutes in the oven. 2. In a large bowl, cream butter and sugar. Add in the egg, vanilla and baking powder and incorporate into the creamed mixture. 3. Stir in the flour, then the raisins and chips until everything is mixed together. 4. Drop spoonfuls onto a parchment-lined baking sheet. Take a fork and gently flatten the dough. Bake for 12 minutes et voila! It’s 10pm on Sunday night and I want chocolate. Problem: we have no easily-accessible chocolate. We do, however, have Nutella. Contemplating but ultimately discarding the idea of simply opening the car and pouring the Nutella straight down my throat (spoons be damned! ), I opted instead to make the Nutella brownie recipe I’d had my eye on for a while! It took as much time to preheat the oven as it did to mix the batter. Four ingredients. No fuss, no muss (and almost no clean up). Perfect. With this recipe, you are no more than 20 minutes away from gooey, chocolatey brownies. You know you want it. Many thanks to Dulcet Devotion for the inspiration! 2. In a medium bowl, mix the two eggs and warmed Nutella until smooth. 3. Add in the flour and salt, mixing until just combined. Do not overmix! 4. Split evenly among lined muffin tins and bake for 12 minutes. Yay! The heat finally broke! That means I can get back in the kitchen and turn the oven on without melting for the first time in weeks. I was in the mood to bake on the last day of the long weekend and decided to make up some muffins. We had bananas in the basket, chocolate chips in the cupboard…decision: made. Feel free to use more chips than I did: there’s really no such thing as too many. 1. Preheat the oven to 375F. Grease or line the muffin tin. 2. In a large bowl, combine the flour, baking powder, baking soda, salt and chocolate chips. 3. In a medium bowl, mix together the bananas, white sugar, melted butter and egg. 4. Make a well in the dry ingredients and pour the wet ingredients in. Stir until everything is just combined – do not over mix! 5. To make the streusel, mix the brown sugar and flour together in a small bowl. Cut in the tablespoon of butter until it resembles coarse crumbs. 6. Spoon the batter into the muffin tin, filling to about the 3/4 mark. 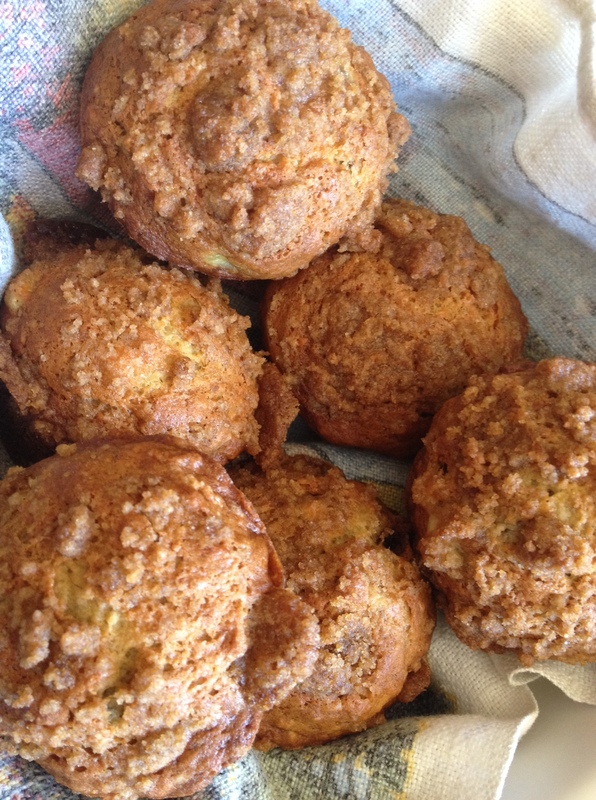 Sprinkle each muffin with streusel. 7. Bake for 18 – 20 minutes. You’ll know they’re done when you insert a toothpick and it comes out clean when you remove it. This recipe is slightly more complicated than the other baking recipes I’ve posted before; however, that’s really only because you need a piping bag (or a really sturdy Ziplock bag) and I’m not great at making the same shape over and over. 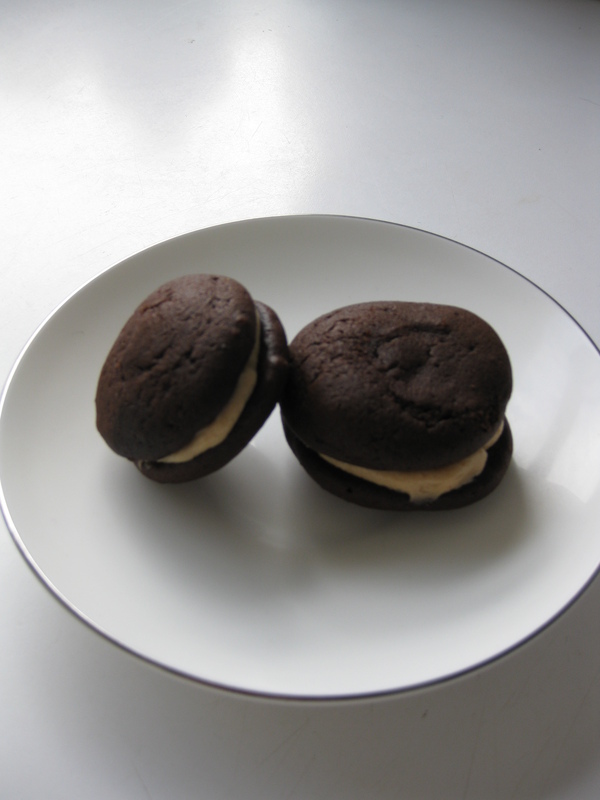 I enlisted the help of The Hot Biscuit and we got down to making whoopie (pies) last Friday night. They turned out really well: rich, sweet, creamy, moist…all the adjectives you could possibly want. 1. Preheat the oven to 375 degrees and line cookie sheets with parchment paper. 2. In a large bowl, beat the butter and sugars together until fluffy (about 3 minutes) with an electric mixer. 3. In another bowl, sift together the flour, cocoa powder, baking soda, and salt. 4. In a measuring cup, combine the milk, egg and vanilla. 5. With the mixer on low, alternate adding the flour mixture and the milk mixture in 3 additions until combined. 6. Transfer batter to a piping bag and pipe 2-4 inch circles about 2 inches apart on the parchment lined baking sheets. Bake for 10-12 minutes. Cool for a few minutes on baking sheets and then transfer to a wire rack to cool completely. 1. In the bowl, beat the peanut butter, cream cheese, and butter together until fluffy. Add in the marshmallow fluff. Gradually add in the confectioners’ sugar and salt. Mix until combined. 2. 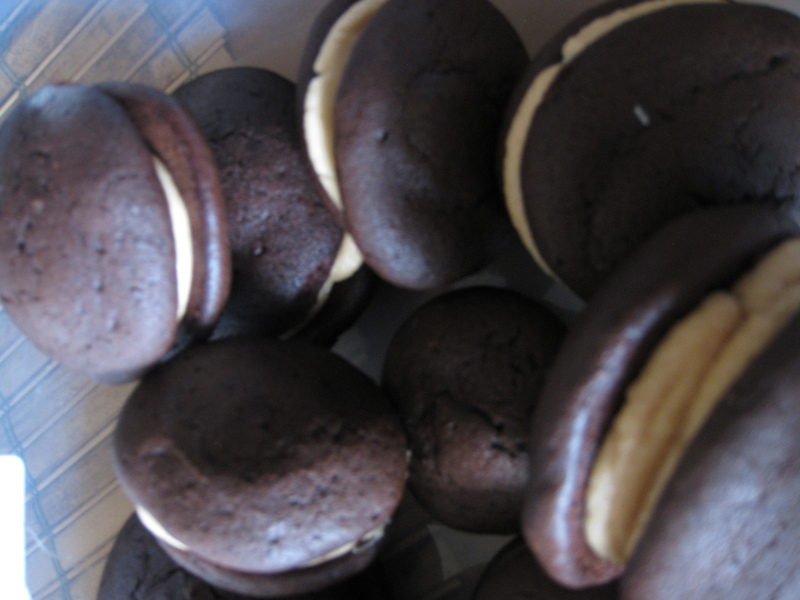 Fill a piping bag with the filling and use to frost the cakes.